Papercrafts by Patti: Pals Paper Arts Celebrity Color Challenge - Rich & Lucky Pie! 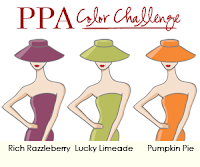 Pals Paper Arts Celebrity Color Challenge - Rich & Lucky Pie! 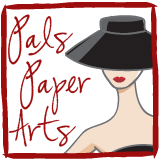 Welcome to the Pals Paper Arts Celebrity Color Challenge! Isn't this a gorgeous set of colors? They remind me of a little bit of Fall and a little bit of Summer, which is exactly the kind of weather we have had in Southern California this week! Don't forget to check out our Celebrity Guest, Regina Mangum at The Stampin' Bean! Her creations are so awesome to look at! I hope you will take the opportunity to play along with our Design Team using any brand of stamps or paper you have that match the colors above. We love to see how creative you can be and enjoy looking at all of the submissions at PPA. Don't forget Stampin' Up's October Specials! Order from my Website any time! Big Shot *FREE* when you become a Demonstrator and buy the Starter Kit! Stampin' Up! has added more items to Clearance Rack in the Online Store, including some holiday products! Clearance Rack items are non-refundable and are only available while supplies last. You must order ONLINE. Beautiful, Patti! You did a fabulous job incorporating the challenge colors! Someone will be a very happy recipient! Love the scattering of doilies across the circles! Very nice! Such a fun card ... love how the polka dots work with the doilies. Nicely done, Patti! This is quite a unique approach to use the Delicate Doilies. The colors really pop against the white! Patti I LOVE these colors and they scream FALL to me here in Michigan. Great CAS card. Hugs.